What if you could replace over 90 servers with just two integrated devices; consolidate 80% of your storage footprint into 9 small-form drives; and generate savings in labor, power, and maintenance costs? 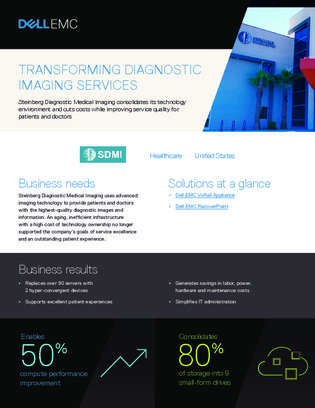 Steinberg Diagnostic Medical Imaging (SDMI) found itself in dire need of these efficiencies, when previously saddled with maintaining a legacy client-server infrastructure with one server per app. The system could not sustain the performance to deliver images and data to patients and doctors as fast as SDMI needed. SDMI was eventually able to achieve a more efficient infrastructure with one hyper-converged system in particular. Read on to learn more about it.